Balscadden FC's last result was a narrow 1-2 win away against Chanel SSC. 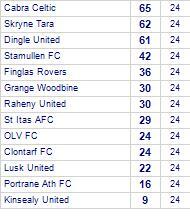 Clontarf FC's last fixture played was a crushing 9-0 win at home against St Brendans United. They are currently on a winning streak of 4 games.